But the real question is why would you put pineapple on pizza? Cloud9 ADC Zachary “Sneaky” Scuderi is at it again with another phenomenal cosplay. This time, Sneaky has dressed up as one of the newest skins in League of Legends, Pizza Delivery Sivir. We’ll forgive Sneaky for putting pineapple on his pizza, but other than that, this cosplay looks great. This post even made Sneaky’s former teammate and current 100 Thieves jungler William “Meteos” Hartman think about getting some pizza delivered. This was Sneaky’s third publicized cosplay following Star Guardian Urgot and Dark Elementalist Lux. Sneaky’s Lux cosplay came just last month when he reached 5,000 subscribers on Twitch. 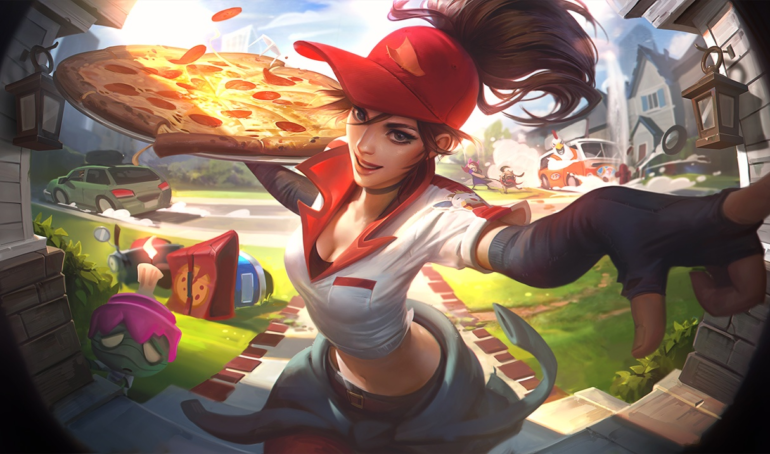 Pizza Delivery Sivir was added to League of Legends in Patch 8.6 alongside some other great skins, including Gun Goddess Miss Fortune, Birdio Galio, and Hextech Alistar. Now that Sneaky has done two cosplays in such a short period of time, fans are wondering how frequently they’ll see this popular ADC dress up as other League champions. Could we see Pulsefire Caitlyn next, or maybe Sneaky’s signature Jhin? After seeing how well these last few cosplays turned out, we’re sure Sneaky will look great no matter what champ he picks next.